Chemical Kinetics is the study of reaction rates, which examines the speed by which reactants are consumed to make products. Concept #1: Understanding Chemical Kinetics. Hey, guys! In this brand new set of videos, we're going to take a look at the rates of chemical reactions. Now we're going to say that chemical kinetics is basically the study of reaction rates. And when we say rates we're really talking about speed. We're going to say the word kinetic comes from the Greek word kinesis, and in Greek, kinesis just means motion. And remember, attached to motion is speed, so chemical kinetics is looking at how fast are reactants or products are changing over a period of time. So that's all kinetics really is and that's what rate is, so rate is tied to speed. And we're going to say up to this point, hopefully, we all remember stoichiometry, so we've learned how to calculate the limiting reactant amount. We've learned to calculate the theoretical yield. Now it's up to us to figure out the rates of these reactions. Figure out how fast are my compounds reacting in my balanced chemical equation. The word “kinetics” is derived from the Greek word “kinesis”, which means motion. So Chemical Kinetics deals with the speed of motion experienced by reactants as they are allowed to react. Concept #2: Kinetics in a Chemical Reaction. We're going to say fundamentally when looking at any balanced equation, here we have a simple one. A is changing into N. A could be any type of compound. B could be any type of compound. But fundamentally, this is a balanced chemical equation. We're going to say when looking at any chemical equation, we're going to say in the simplest way it's just our reactants breaking down to give us products. If we take a look at the time elapsed, when we start out, it’s 0 seconds. Initially all we have are the white balls. Those are A. 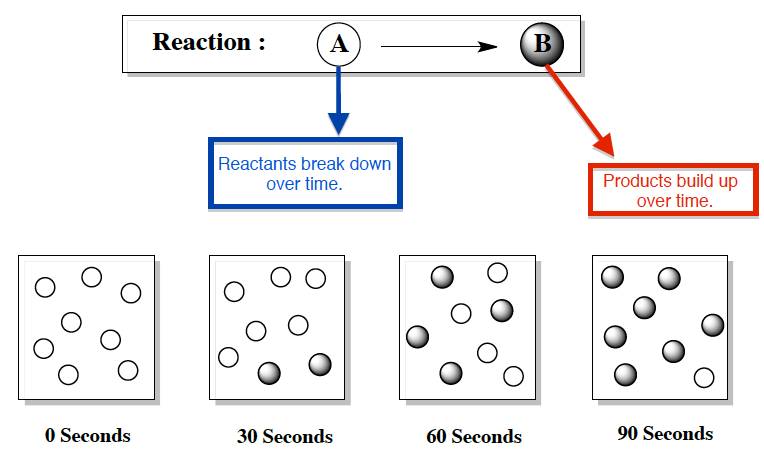 In the beginning, before a reaction is even allowed to start, we have only reactants. Take a look. Over time, what begins to happen? Over time, you’re going to get more and more of compound B, our product forming. The more our product forms, the less reactant we’re going to have around because remember, the products are made from our reactants breaking down. Eventually, we’ll say that our reaction reaches completion. We’re going to say when a reaction reaches completion, basically almost all of the reactants are gone and all we have are products. We're going to say for reactions that go to completion, we have one single arrow going forward. Later on, we’re going to learn about reactions that don't reach completion but actually reach equilibrium. At those states, we're not going to have a single arrow going forward. We're going to have two arrows. One is going forward and one is going backwards. We're going to say when we have double arrows we’re at equilibrium. When we get to states of equilibrium, we don't get rid of our reactants. Eventually we're going to have some reactants and products basically living in harmony with each other, living in equilibrium. For now, we're just going to be worried about reactions going to completion but eventually we’re going to get to the point where we should realize that sometimes chemical reactions go to equilibrium. A chemical reaction is simply reactants breaking down and reassembling to form products. Depending on certain conditions, a chemical reaction can either happen very quickly in seconds or take place over several years. Concept #3: Slow vs. Fast Reactions. Hey, guys! In this brand new video, we're going to take a look at the factors that affect the rate or speed of a chemical reaction. Now, remember we said that chemical kinetics is basically looking at how fast our reactants or products change overtime. And we should realize that when it comes to a chemical reaction, a reaction could either go slow or it can go incredibly fast. And we're going to say that there are certain factors that influence if it'll go slow or go fast. Concept #4: Kinetics & the Concentration of Compounds. The first factor is concentration. We're going to say in order for a reaction to occur, molecules must collide. Molecule A has to combine with molecule B. What we should realize here is increasing the number of molecules in a container, we’re going to have more of them bouncing around. There's a greater chance of them colliding. We’re going to say adding more molecules inside the container increases their collisions. As a result, we have a greater chance of them sticking together, them sticking together to form our product is the reaction. We’re also going to say they not only need to collide with each other, but they need to collide with each other with sufficient energy. They have to hit each other in the correct spots. They have to hit with sufficient energy and correct orientation. In terms of sufficient energy, just think of it as this. You have two cars going head to head to each other. If they're going at five miles per hour, they're going to hit each other but they're not going to be able to stick together. But let's say both cars are both going at a hundred miles per hour towards one another. That head-on collision would force them to be basically smashed together. In the same way, our molecules do the same thing. Molecules have to be moving incredibly fast in order to stick to one another. Otherwise, their collision is going to be elastic, meaning they’ll just bounce off each other. Also, if you guys are bio majors just remember we also talk about activation sites. Basically they have to eat each other in the correct spot. In that way, they'll stick together. Again, if they don't hit each other in the correct spot, they’re just going to bounce off of one another. In order for a chemical reaction to occur two molecules must collide. The more concentrated a solution then the greater the chance of them colliding. Concept #5: Kinetics & the Surface Area of Compounds. The second factor that we have to look at is surface area. Basically, we're going to say the greater the surface area, the greater the chance the reaction will occur and the faster that reaction can occur. We’re going to say here the frequency of collisions increases with increasing surface area. If we take a look at these two compounds, both have four carbons but they’re arranged differently. In the first one, it's kind of linear. It’s just a straight chain. But in the other ones, it’s shaped like a square, so it's cyclic. It's a ring. What you should realize here is linear structures have more surface areas to react. You always want a linear structure. The structure on the left would have greater surface area and therefore its rate would be faster than the cyclic one. Let’s say we were comparing two compounds, neither of which were cyclic. Let's say we had a second compound that we're comparing. Let’s say we’re comparing this one here with our same structure we said earlier. In this case, this would still have more surface area because again, it’s linear. This right here kind of branches off. We call that a branched group. This is the linear part of our structure, but this piece here is kind of sticking out. We’re going to say with increased branching, there's less surface area. Again, it's better to be linear with no branching groups and it’s also better to be linear and not cyclic like we have here. This structure in the middle would be the one with the most surface area. For a collision between molecules to be successful, molecules join at their active sites. The larger their surface area then the more places the molecules can successful join. Concept #6: Kinetics & Temperature. The next factor I was going to say is temperature. We’re going to say increasing the temperature increases the rate of the reaction by increasing the energy and frequency of collisions. Think about it like this. If we increase the heat around a container that's filled with gas molecules, those gas molecules start to get excited because what's happening is they’re going to absorb the thermal energy from the heat source. They then convert this thermal energy into kinetic energy, energy of motion. In that way, they're going to move a lot faster. Again, what do we say? We say you have to move with enough energy. You have to be moving a lot faster in order to collide hard enough to stick together. If you're moving faster, you have a greater chance of hitting one another within a given amount of time. Increasing the temperature will increase the energy and the amount of collisions we get within a snapshot of a moment. The General Rule is increasing the reaction temperature by 10oC will cause the rate to double. Concept #7: Kinetics & the Catalyst. Finally, the fourth thing that can affect our rate, which can either make it fast or slow. We're going to say a catalyst. A catalyst can increase the rate of the reaction by decreasing the energy of activation. Here what we're going to have is our reactant line. Over here, we're going to have our product line. Basically we say that this is called an energy diagram. Basically our reactants are starting off here at around energy of 50 kilojoules. The reactants then have to travel up here to the top at this very point up here. This is called our transition state. Just realize, a transition state is a hybrid. The transition state looks a little bit like the product, a little bit like the reactant. When you're at the transition state, you have two possibilities. You could either slide back down to become a reactant again or if you have enough energy, you can tip over and slide down to become a product. We're going to say the distance from the top of the hill all the way down to the bottom of the hill where the reactant line is, that is our energy of activation or Ea, the amount of energy it takes to climb up to the top. We're going to say the way a catalyst works is a catalyst changes the reaction pathway. It actually makes the hill shorter. You still end with the same energy for your products but you don't have to travel up as high to get to the transition state. It lowers the energy of the transition state, so you get to the top of the hill faster and that way you can slide down the hill faster to become a product. That’s how our catalyst will work. Just remember the four factors that influence the rate of a reaction. If you can manipulate these guys in a certain way you can make a reaction faster. Increasing concentration, increasing surface area, increasing temperature or adding a catalyst – all will make your rate faster by doing each of these different factors. Just remember the four factors involved for speeding up a chemical reaction. A catalyst helps to speed up the rate of a reaction by lowering the energy of activation (Ea). Concept #4: Kinetics the Concentration of Compounds. Concept #5: Kinetics the Surface Area of Compounds. Concept #7: Kinetics the Catalyst. The value for the rate constant of a reaction can generally be expected to (A) decrease with increasing temeprature. (B) increase with increasing temperature. (C) decrease with increasing temeprature only when reaction is exothermic. (D) increase with increasing temeprature only when the reaction is exothermic. This chapter dealing with Chemical Kinetics has many formulas and here we organize them into their major sections. The oxidation of propane is given by the reaction below: C3H8 (g) + O2 (g) → 3 CO2 (g) + 4 H2O (l) Which graph accurately shows the concentration of CO2 as a function of the time for the reaction above? Which of the following would result in a decrease in the rate for the following reaction? N2 (g) + O2 (g) ⇌ 2 NO (g) a) Changing the temperature. b) Adding a catalyst c) Increasing the volume by adding solvent. d) Adding N2 (g). An increase in the temperature of the reactants causes an increase in the rate of reaction. The best explanation for this behavior is that as the temperature increases: A. the concentration of reactants increases B the activation energy decreases. C. the collision frequency increases. D. the fraction of collisions with total kinetic energy &gt; E a increases. E. the activation energy increases. All of these changes increase the value of the rate constant for a reaction except (A) decreasing the activation energy. (B) raising the temperature. (C) adding a catalyst. (D) increasing the concentration of reactants. What is meant by the term reaction rate? Name three factors that can affect the rate of a chemical reaction. Automobile catalytic converters have to work at high temperatures, as hot exhaust gases stream through them. In what ways could this be an advantage? In what ways could this be a disadvantage? Most commercial heterogeneous catalysts of importance are extremely finely divided solid materials. Why is particle size important? An energy profile for the reaction A (left), and the change in concentration of B as a function of time (right), with and without a catalyst. Green curves show the reaction with a catalyst; black curves show the reaction without a catalyst.What quantity dictates the speed of a reaction? Many metallic catalysts, particularly the precious-metal ones, are often deposited as very thin films on a substance of high surface area per unit mass, such as alumina (Al2O3) or silica (SiO2).How does the surface area affect the rate of reaction? Temperature dependence of the rate constant for methyl isonitrile conversion to acetonitrile.Would you expect this curve to eventually go back down to lower values? Why or why not? Temperature affects the rate of the chemiluminescence reaction in light sticks: The chemiluminescent reaction occurs more rapidly in hot water, and more light is produced.Why does the light stick glow with less light in cold water than in hot water? Two similar reactions have the same rate constant at 25oC, but at 35oC one of the reactions has a higher rate constant than the other. Account for these observations. Two reactions have identical values for Ea. Does this ensure that they will have the same rate constant if run at the same temperature? Does the rate constant for a reaction generally increase or decrease with an increase in reaction temperature? What variables does the rate constant depend on? The mechanism for the oxidation of HBr by O2 to form 2 H2 O and Br2 4HBr(g)+O2(g)2H2O(g)+2Br2(g) is shown below. HBr(g)+O2(g)HOOBr(g) HOOBr(g)+HBr(g)2HOBr(g) HOBr(g)+HBr(g)H2O(g)+Br2(g).HBr does not react with O2 at a measurable rate at room temperature under ordinary conditions. What can you infer from this about the magnitude of the activation energy for the rate-determining step? How do reaction rates typically depend on temperature? What part of the rate law is temperature dependent? In a reaction involving reactants in the gas state, how does increasing the partial pressures of the gases affect the reaction rate? A chemist burns steel wool in air and observes that it burns slowly. She burns steel wool in pure oxygen and observes that it burst into flames, burning more rapidly. Which factor is affecting this reaction rate?A. The physical state of the reactants.B. The reaction temperature.C. The reactant concentrations.D. The presence of a catalyst. How would the following events affect the rate of the following general reaction? How do enzymatic catalysts increase the rates of reactions? a. they shift the reaction equilibrium toward the products. b. they promote the formation of a transition state. c. they lower the activation energy of the reaction. d. they increase the concentration of reactants. e. they decrease the free energy of the reaction. Is each of these statements true? If not, explain why. (b) Halving the P for a gaseous reaction doubles the rate. Is each of these statements true? If not, explain why. (c) A higher activation energy gives a lower reaction rate. Is each of these statements true? If not, explain why. (d) A temperature rise of 10°C doubles the rate of any reaction. Is each of these statements true? If not, explain why. (g) The rate of a reaction increases as the reaction proceeds. The gas-phase reaction of NO with F2 to form NOF and F has an activation energy of Ea = 6.3 kj/mol and a frequency factor of A = 6.0 x 108 M-1 s - 1. The reaction is believed to be bimolecular:NO(g) + F2 (g) → NOF (g) + F(g).Suggest a reason for the low activation energy for the reaction. What is the difference between average rate, initial rate, and instantaneous rate? Describe the effect of each of the following on the rate of the reaction of magnesium metal with a solution of hydrochloric acid: the molarity of the hydrochloric acid, the temperature of the solution, and the size of the pieces of magnesium. As the temperature increases, does the reaction rate increase or decrease? Consider the following graph of the concentration of a substance X over time.Is each of the following statements true or false? (a) X is a product of the reaction. (b) The rate of the reaction remains the same as time progresses. (c) The average rate between points 1 and 2 is greater than the average rate between points 1 and 3. (d) As time progresses, the curve will eventually turn downward toward the x-axis. Estimate the number of moles of A in the mixture after 30 s.
Be sure to answer all parts.Just as the depletion of stratospheric ozone threatens life on Earth today, its accumulation was one of the crucial processes that allowed life to develop in prehistoric times: 3O2 (g) → 2O3 (g) At a given instant, the reaction rate in terms of [O2] is 2.17 x 10-5 mol/L•s. What is it in terms of [O3]? Enter your answer in scientific notation. Consider the reaction 8H2S(g) + 4O2(g) → 8H2O(g) + S8(g) Δ[H2S]/Δt = -0.030 M/s A. Find Δ[O2]/Δt. B. Find Δ[H2O]/Δt. C. Find Δ[S8]/Δt.D. Find the rate of the reaction.